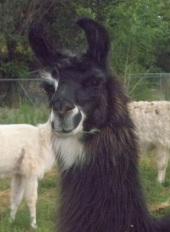 Dalai was one of our first llamas and cam on Valentines Day in 2009 when she was about a year old. Dalai is very curious about everything – she likes to know what is going on and will be the lookout for everyone else. She will guard the herd and is not afraid to confront anything. She will do anything for a llama treat which has made her a superstar at learning what we want from her. Dalai is a favorite for many trekkers because of her keen interest to get to know her handler. She will come up close to smell you but don't be alarmed. She usually goes with whoever is in the lead. Dalai was rescued from living in a tiny corral at an abandoned farm when she was 18 months old. Suki came to us on the 4th of July 2010 and was about 6 years old. Suki always wants to know what is coming ahead. Suki would be a great cart puller – something we want to try soon. Suki is our tallest female llama and she likes to be right up there in front with Dalai. Llamas are very social and all of ours like to be within eye sight of each other and some like to pair up. Suki is a touch-friendly llama and her soft fleece is wonderful to feel. She was handled more than usual as a young cria (the name for a young llama) so she tends to be more forward than the typical llama. Suki is also a hummer – meaning she talks all the time. She has a little anxiety sometimes when we are going somewhere - especially if it is a new place. Verdi came from Nebraska in 2016 when he was about 15 years old. Verdi was a packing llama. He packed a lot of elk in his days as a packer. Verdi likes to have his rump scratched and to be brushed. He loves apples and carrots so bring some over and watch him get excited. He is a wonderful walker and can be led by anyone. He is very attached to the herd and does not like to be left behind and so has a quick step when he has someone to catch up to. Verdi is our tallest llama and if very impressive looking. He also knows how to cush on command and expects a treat for doing that trick. Twolip (IRL name Twixie Lips) is a new rescue who also came from Nebraska with Verdi and did a lot of packing. Twolip and Verdi are bonded since birth and are a great pair. Twolip is a great walker and goes everywhere that Verdi goes. He also is bonded with the girls and positions himself at night to be able to see everyone. Twolip and Verdi often hum to each other while waiting to go places. Twolip has a very soft fiber and lets you stroke his neck. He and Verdi are both 17 years old (as of 2018) and have a lot of experience with people. They love treats and are easy to hand feed and take on treks. Luke came to us from Isleta animal control in June of 2015 and we cared for him for him for the summer. 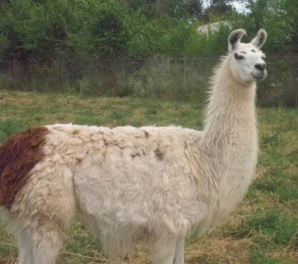 He then moved to the East Mountain area to live with other male llamas that he could learn from as he did not have any experience being a llama with other llamas. He came back to us in 2018 and is now one of our packing llamas. Luke is very sweet and gentile. He is now gelded and living with the whole herd very happily.